All bee life cycles go through these stages, although there are great variations between the life cycles of solitary, honey and bumblebees, (as explained elsewhere on my site - see links. Unlike bumblebee colonies, honey bee (Apis mellifera) colonies can survive the winter, provided they have enough food resources, are able to keep sufficiently warm, and are free of diseases and predators. However, in the winter, colonies are smaller than in the summer: there are no drones, and perhaps part of the colony left the hive (in a swarm) to form a new nest elsewhere. Some of the workers will also die naturally during the winter months, however, there may be up to 20,000 workers left, and a queen. The queen and the rest of the colony will form a winter cluster to keep warm during the cold months. There will be no brood to tend to, and no eggs are laid during this time. However, as the days begin to warm up, and the flowers begin to bloom, honey bees will begin to go out foraging again, and the queen honey bee will begin to lay eggs. After 3 days, eggs hatch into worker larvae. During this stage, each larva will be fed about 1,300 times a day! They are fed by worker bees that have the specific task of tending the brood, and are referred to as the ‘brood nurses’. 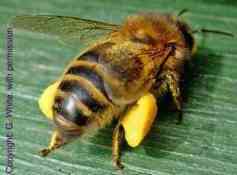 The food given is made from pollen, honey, and secretions from the brood nurses, and is called ‘bee bread’. (Find out more about bee bread ). Potential honey bee queens, however, are given ‘royal jelly’, a much richer food. After about 6 days, the egg cells are capped, and each larva spins itself a cocoon and becomes a pupa. Worker bees take 10 days to emerge from pupae. Drones take slightly longer. New Queens, however, take about 6 days. For How Long do Honey Bees Live? The life spans of honey bees can vary greatly, depending on their function in the colony, and when they emerged in the season. I have written a page comparing the lifespans of the different types of bees, called How Long Do Bees Live? Drones may live just a few weeks, or they could live up to 4 months. Drones that mate with new honey bee queens, will die immediately after mating. By the end of the summer, they will no longer be needed by the colony. Honey bees need reasonable weather to forage, and of course, during the winter time, there is far less nectar and pollen available. Drones do not collect pollen or nectar, and those still alive will be elbowed out by the workers, so that winter food resources are not drained! Learn more about drones. Workers raised in the spring and summer have shorter, busier lives, and may live 6 or 7 weeks. This is the most productive time for the colony, with larvae to be fed, nectar and pollen to be gathered, and honeycomb to be built. Those raised in the autumn will have far less to do, with no brood to care for. Their main concern will be to survive the cold until the following spring. However, they may live 4 to 6 months. Whereas the queen honey bee life cycle revolves primarily around mating and laying eggs, the life of worker honey bees progresses through various stages of functions within the colony. A productive queen, favoured by the colony and free from disease should certainly live for about 2 yrs, but could live for up to 3 or 4 years, partly depending on whether the beekeeper decides to get rid of the queen, or whether the colony decide to replace her. The act of deposing the queen by the colony is called ‘supersedure’. Learn more about the role of the Honey Bee Queen. 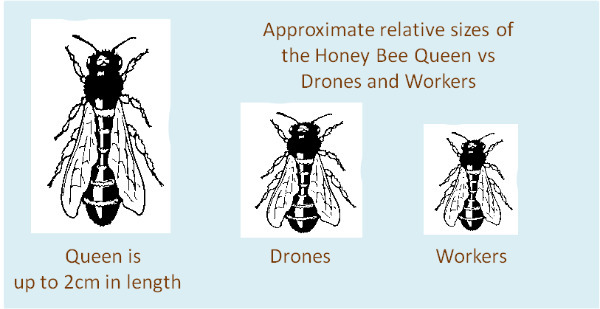 The diagram below give you an idea how large the queen is, in comparison with the workers and drones. 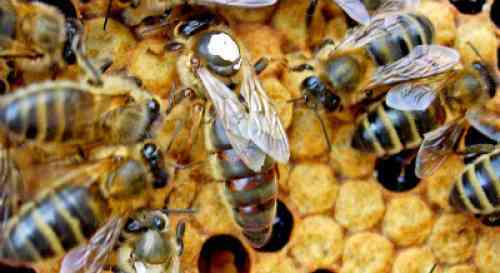 Queens are difficult for beekeepers to identify among the thousands of workers, and so they are marked with a special type of paint, as can be seen by the dot of white paint on the photograph below. So this has given you a brief summary of the honey bee life cycle, but you can learn a lot more about some of the specific stages, such as swarming, by exploring the site further. Link from Honey Bee Life Cycle to this page of fun honey bee facts. Swarming is a natural part of the honey bee life cycle. Learn more about it on this page. So now you know about the honey bee life cycle. But how much do you know about bees generally7? Take a quiz! Go to this general information page about honey bees. And why do they make it? Find out here. Take a look at these tips explaining how you can create a garden to attract bees and other pollinators. Discover how each of the different types of bees plays an important role in pollination.